Ted Mahsun: What's Up Ted. Just a small update for you. I've just had the craziest week... and signs are pointing that the weeks to come are just going to get crazier. 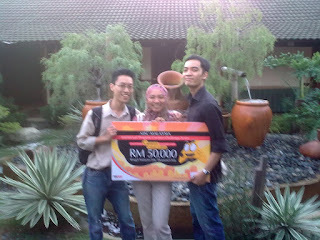 Probably not as crazy as winning RM50,000 though, which I (along with my fellow team members, Ash and Lina) did. A couple of months ago, me, Ash and Lina decided to take part in a little competition. All we had to do was send in a proposal to design a computer game. No problem. Except that I was doing (and am still doing) the CELTA course, an intensive English teacher training course. I ended up having to accomodate sleepless nights just to get the presentation for the game proposal, my lesson plan for a class the day before the game presentation AND an assignment done in time. So what was your game about, and on which platform? It's a puzzle game and it's for Windows... (for now). Congrats! What's the computer game about, and will it be available soon? In what format? The game's a puzzle game. All will be revealed in time. We still have to develop it (that's what the money's for) and if we get there, it'll be available probably next year(ish). It was originally planned for Windows, but we're considering Flash for a web-based deployment. Yes, we will! But not so soon. I'll post an announcement up when the time comes.